Toast the New Year in Style! Grab a fellow wine lover and treat your palates to some of the finest vintages and locally sourced produce the UK has to offer. 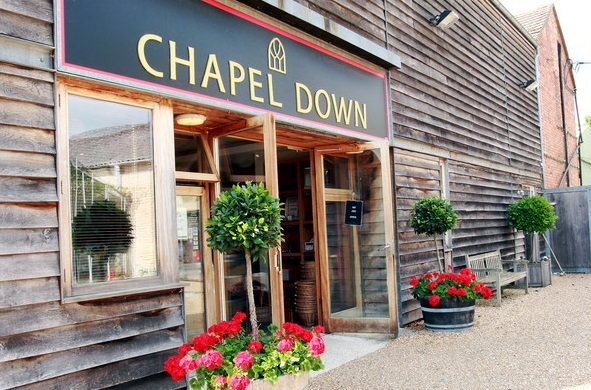 Located in Tenterden, in the heart of the Kent countryside, Chapel Down Winery is an idyllic location for a scenic vineyard tour. They produce a world-class collection of sparkling and still wines, together with an award-winning range of ‘Curious Brew’ beers and ciders. The sparkling wines are created using the Traditional Method, the same as Champagne, from fruit sourced from the South-East of England and together you can sample the delicious end product. You’re set to be educated and entertained by your knowledgeable guide who will take you out into the vineyards and then into the state-of-the-art winery. In the vineyards, you’ll discover the essential role of the unique micro-climate on the south-facing slopes of the North Downs. In the winery, you can see all of the grape-to-glass processes used to create superb wines. Highest levels of viticulture and winemaking practices are employed with whole-bunch pressed fruit undergoing wild yeast fermentation and extended barrel ageing. You can complete the tour in style with a tutored tasting of some of the acclaimed vintages. Once sampled, you can pick the wine of your choice to enjoy with a three-course lunch at Chapel Down’s very own The Swan restaurant. The rustic modern restaurant sits above the shop in the Chapel Down vineyard and boasts a cosy lounge and a lovely rooftop terrace with views over the vines, with two AA Rosettes awarded for the tasty cuisine made with only the best seasonal produce. Situated on one of the oldest agrarian landscapes in Britain, Kit’s Coty is named after the monuments to the first settlers of Britain’s earliest farming society who recognised the fertility of the land in the third millennium BC. Chapel Down acquired the land in 2007 and 95 acres are now planted with Chardonnay, Pinot Noir, and Bacchus vines. At Kit’s Coty vineyard the elements combine to produce wines of exceptional quality. It is sheltered by steep chalk hills that rise above it, keeping cool northerly winds at bay. The expansive southerly aspect ensures the vines capture the sunshine all year long while the warm, free-draining chalk soils provide the perfect ‘terroir’ for producing well-balanced vines and intensely flavoured fruit. Not surprisingly, therefore, the vineyard also has the support of leading chefs such as Gordon Ramsay and Jamie Oliver and is the official supplier to Downing Street where Chapel Down and is served at official events replacing Champagne. Eager to try the wines and see how they are made? Join us on a tour in 2017. Enjoy the must-try English wine of great quality without worrying about getting in your car afterwards!